Agent Status is a helpful way to show your entire team whether or not you are free to take a call. Nectar Desk offers five default status settings which are, Available, On a Call, After Call Work, Away and Offline. These statuses can also be changed under the settings menu to better suit your business needs. An agent will only receive a call if he or she is available, other settings will flag the agent as busy and will not forward the call to them. You can change your status at any time from the navigation bar, using the first drop-down menu on the top right corner . Nectar Desk will change your status automatically when you are on a call. When your status changes, everyone signed in to your installation will know what you’re up to. 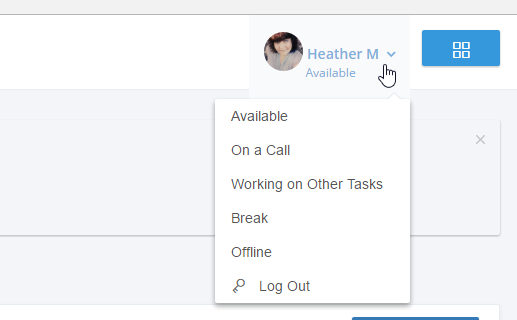 They can see your status in the reporting tab, when transferring calls and when starting a conference call.